The origins of English law, aka common law, are decidedly murky as they were based on unwritten customs, passed down from generation to generation. William the Conqueror (1028-87), Henry I, King Arthur and King Alfred, Canute (995-1035), Ethelbert and Edward the Confessor – all tried their hand at law. The earliest offences appeared to be aimed at protecting public institutions (as opposed to offences to against individuals), such as the royal family or the church. Crimes included the ever-popular treason, plotting against the king's life, the harbouring of exiles or fighting in a Church. Heathenism was prohibited (the worship of idols or of the moon, fire, rivers, stones or trees) and under Canute, a woman convicted of adultery would "forfeit both nose and ears". Alfred's laws provided for compensation to the victim (called a bot). The detail was fantastic. For example, causing the loss of a big toe cost the offender 20 shillings. The 2nd toe over, 15 and only 9 for loss of the middle toe, 4 for the 4th and 5 for the baby toe. There was little imprisonment. Instead, the punishment was death, mutilation or whipping (flogging). Canute holds a special place in the history of the law. "The very word 'law' is not English but Norse." In his laws, Canute introduced a novel concept, one which would sow the seed for humane or proportionate punishment. "Though anyone sin ... let the correction be regulated so that it be becoming before God and tolerable before the world. We command that Christian men be not on any account for altogether too little condemned to death." But "capital punishment would seem to have been common after Canute's time, notwithstanding his cautions against the abuse of it, as William the Conqueror found it necessary to forbid it." William tweaked the law enforcement system then in place and consisting of a sheriff or similar officer appointed for each region. William forced all men to join in groups of tens (frank pledges) for and to thus act as law enforcement and ensure the peace. "All persons, unless excused by reason of their rank or the amount of their property ..., must be enrolled in a tithing – a group of ten men presided over by a tithing man, and if one of the tithing committed an offence, the other nine must produce him for trial". Surreal legal concepts ran amuck throughout the epoch. To check if a person was innocent or truthful, they'd be given a red hot piece of iron to hold, or their hand plunged into boiling water. These were called trial by ordeals, the theory being that God would prevent harm from coming to the person if they were honest. The logic behind ordeal by water was mind-boggling: if the person drowned, then he was innocent (but dead). If he floated he was guilty and thus could be justifiably mutilated (usually by losing a foot or hand) or executed. There was a similar ordeal by fire which, one can safely assume, had the same success rate as ordeal by water. Some early criminal cases refer to the accused having been given the opportunity of "purging herself by fire". With no sarcasm intended, one author complained of the "decay" of this "method of proof" as follows: "It was hard to get convictions"! A defendant had another way to fight off a charge. If he could get enough people to "back his denial by their oaths, he will win his case". This was called compurgation. It seemed as if the clergy were particularly adept at rallying compurgators in their times of trouble with the law. Assuming an accused lived to trial, his travails were not over. The tradition of criminal law has been private vengeance and as it slowly converted to a court-administered process, hybrid justice appeared. Such was trial by battle (or trial by combat) where the accused engaged battle against the victim before a judge. If the accused was defeated before the stars appeared in the sky, he was hanged. If he defended himself or won by that time, he was acquitted. Apparently, even a judge might be called upon to defend his judgment in this manner. The risk of being challenged to trial by battle would of necessarily scared away many litigants as only children, women or those over 60 could decline. Soon, everyone was hiring private "champions", gladiators, who could do their battle for them. "Churches (and) landowners ... permanently retained such champions". 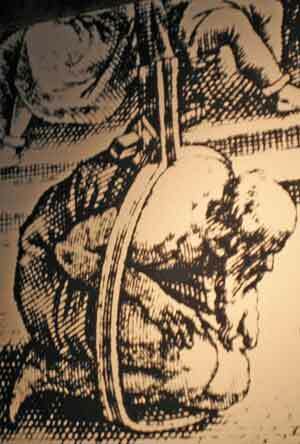 A person nabbed and convicted of stealing would be exposed publicly in stocks for three days in the public market and then executed by gibbet (a primitive guillotine). Treason carried with it the worse punishments, such as being drawn and quartered (eg. William Wallace in the Law Museum) or burned. "In practice, women were strangled before they were burnt. However, this depended on the executioner". A conviction for poisoning was punishable by being boiled alive. With typical British pluck, one legal history author complains about cruel punishments on the "Continent" but that "English people, as a rule, have been singularly reckless about taking life but they have usually been adverse to the infliction of death by torture". Holdsworth, W., A History of English Law (London: Methuen & Co, 1903). Plucknett, T., A Concise History of the Common Law (London: Butterworth & Co., 1940). Stephen, J., A History of the Criminal Law of England (New York: Burt Franklin, 1883).